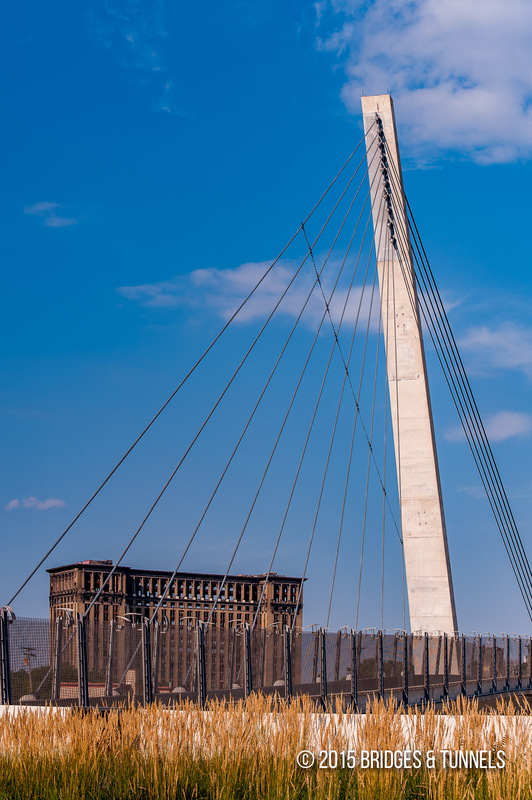 The Bagley Pedestrian Bridge is located in the Mexicantown community of Detroit, Michigan and crosses Interstate 75. 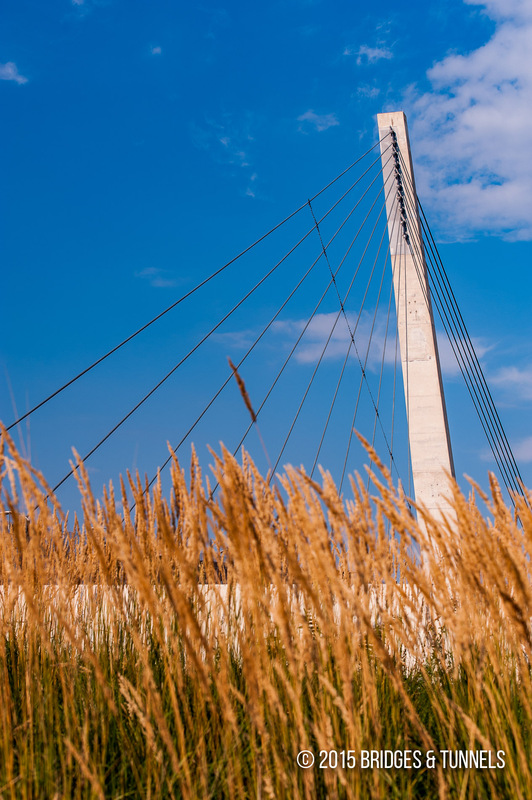 It was the first cable-stayed span to be completed in the state. The Mexicantown neighborhood had attracted Hispanic and Latino families since the 1920’s, but was physically divided in 1970 when Interstate 75 was completed through the heart of the neighborhood.1 During an Environmental Assessment for the Ambassador Bridge Gateway Project in the 1990’s, the Michigan Department of Transportation (MIDOT) and the Federal Highway Administration identified reconnecting the Mexicantown community as a major need. Community engagement during the Gateway Project led the development of the bridge.1 The theme of the project was “Connecting Neighbors,” as it sought to not only reconnect and enhance the Mexicantown community, but that of Detroit and Windsor and the United States and Canada. The first workshop to obtain public input to refine the project alternatives, including a proposed pedestrian bridge along Bagley Avenue, was held in July 1996.1 A design competition for the proposed Bagley crossing was held in October 1998, and inFORM Studio was selected as the architect.2 MIDOT issued a Request for Qualifications in October 2008, launching a competition for public art for the east approach to the proposed Bagley Bridge.1 In December, Detroit artist Hubert Masset was selected among 46 applicants. Construction on the Bagley Pedestrian Bridge began in 2009 and was opened on May 5, 20101 at a cost of $5 million.2 A public ceremony, sponsored by MIDOT, the Southwest Detroit Business Association and the Detroit Consulate of Mexico, was held on the crossing.1 The Bagley Bridge was the first cable-stayed bridge in the state, with a main span of 420 feet supported by 15 tension cables radiating from a 150-foot tower. Bagley Pedestrian Bridge – “Connecting Neighbors. N.p. : Federal Highway Administration, n.d. Print. “Bagley Avenue Pedestrian Bridge.” Critical Detroit. 21 Apr. 2009. Web. 31 Dec. 2015.